A beautiful 9ct white gold ring featuring a delicate heart design, each heart being set with a glittering diamond. Totalling 10 points, this elegant ring offers a feminine twist on the classic diamond ring. 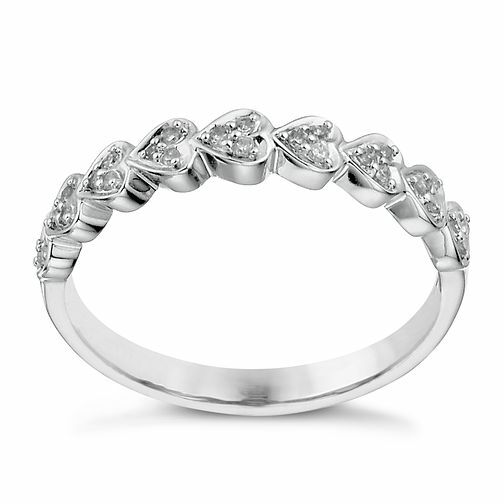 9ct white gold 10 point diamond heart ring is rated 5.0 out of 5 by 5. Rated 5 out of 5 by Anonymous from Love at first sight My partner picked this out in store as my wedding ring, looks so much better than picture, its perfect and i couldn't find anything i wanted more, can't wait to wear it.